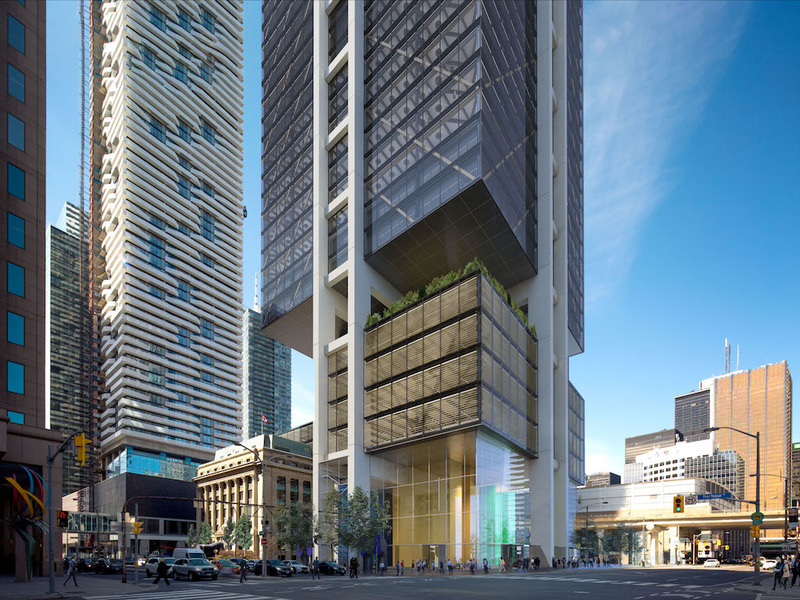 World-renowned British architecture firm Rogers Stirk Harbour + Partners is designing a 60-storey office tower in Toronto’s South Core at 30 Bay Street. While yesterday’s announcement by developers Oxford Properties outlined a 1.4 million square foot Class AAA office property — marketed as ‘The HUB’ — further details of the project have yet to be revealed, with a planning submission now being filed with the City of Toronto. 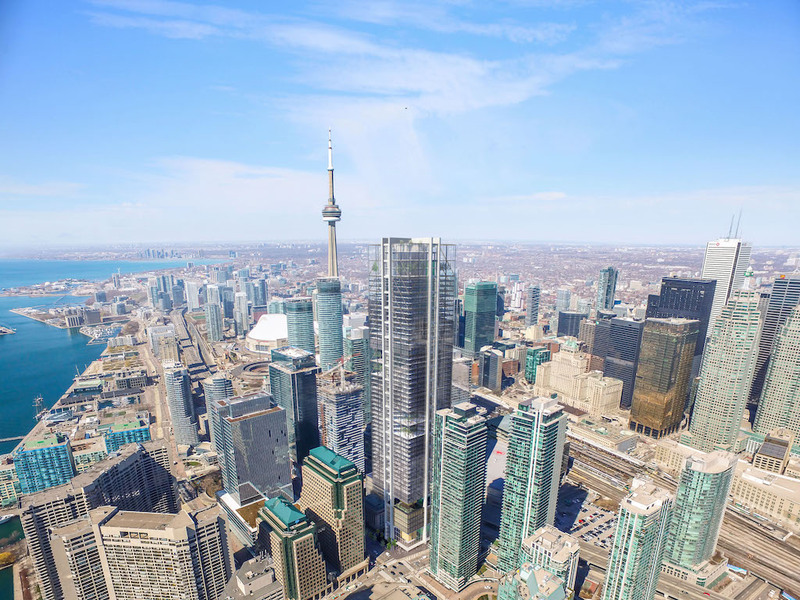 Aerial rendering of the project in Toronto’s South Core skyline. Image via Oxford Properties. Two preliminary renderings of the project depict a visible exoskeleton stretched across the glass body of the tower, which is punctuated by concrete columns along with a number of multi-storey atriums. Dotted with greenery, the mid-tower atria are topped by a larger rooftop winter garden. 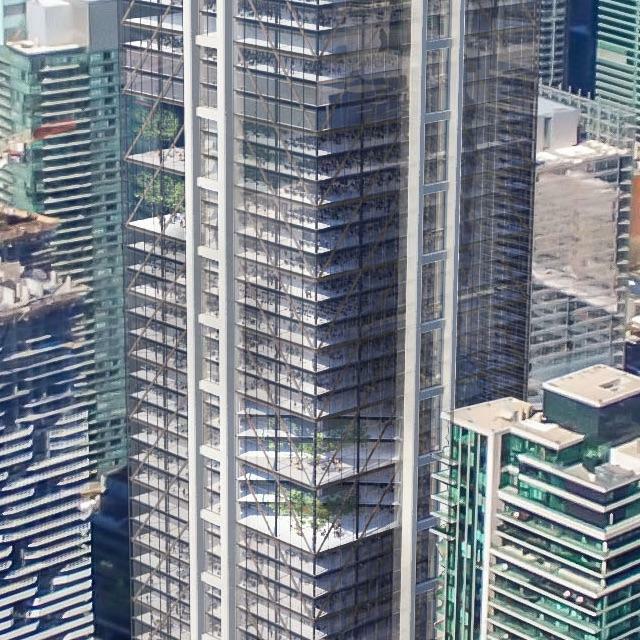 Located immediately west of the Toronto Harbour Commission building, the tower would be positioned to allow the historic structure to remain prominently visible from Bay Street, with a cantilevered floor plate draping over the tower’s rectilinear base structure. The base structure, with the Toronto Harbour Commission building visible at left. Image via Oxford Properties. Led by the Pritzker Prize-winning Richard Rogers along with Ivan Harbour, Graham Stirk and Mike Davies, Rogers Stirk Harbour + Partners is one of the best-known names in the architectural world, with a portfolio of attention-grabbing projects from around the world, including the Leadenhall Building and Lloyd’s Building in London’s financial district. In Toronto, the firm is also leading the design for the St. Lawrence Market’s upcoming north food hall. Further details of the project — including the full architectural team — are likely to emerge once Oxford’s submission to the City of Toronto becomes publicly available in the coming days.